Livescribe's smartpen has been around for a while, and it has proven to be quite a useful tool, especially for professionals who still like to take down handwritten notes. It was originally released for Apple devices, but the Livescribe 3 smartpen has finally been given life for Android devices, with its Livescribe+ app now available in the Google Play store. Essentially, Livescribe's smartpen is a Bluetooth device that can keep in constant contact with your phone once you switch it on and pair it (using another app called Livescribe Link). Through this connection, it will stream its strokes to the installed Livescribe+ app in real-time. But it doesn't have to be in real-time; you can just take notes and then synchronise the pen with the app after the fact. It's a pen with a thicker than usual diameter because of the electronics it houses, including the Bluetooth transmitter, micro-USB charging port, and tracking devices that feed your writing and scribbles directly into the app. The caveat is that you can't just use any writing pad. Instead, one of Livescribe's own notepads is needed. Livescribe notepads are mapped to the pages in the app via a tiny grid of dots that can be seen when you hold the pages to the light -- Livescribe actually calls it dot paper -- and they also feature controls that you can tap on with with the pen (such as to start and stop recordings, which we'll get to in a moment). The app always knows which page you are writing on. A starter notepad is supplied with the smartpen (A5 size with ruled pages and spiral binding), which has 100 sheets. You must buy replacement pads whenever you run out. There are different types you can buy, including A4-sized spiral notebooks. 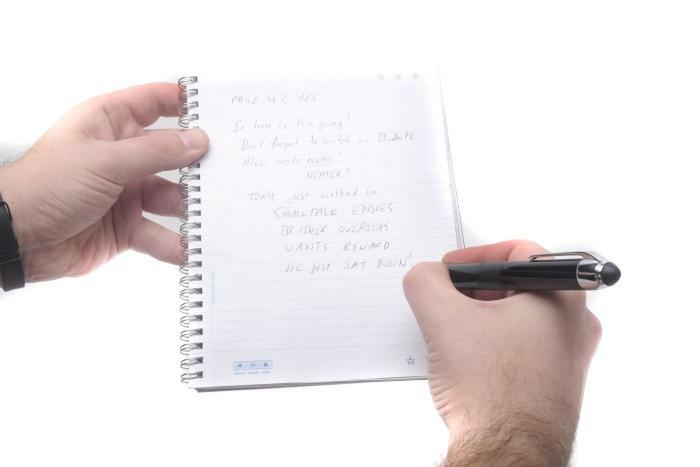 Dot paper is an ongoing 'consumable' cost for the Livescribe smartpen. 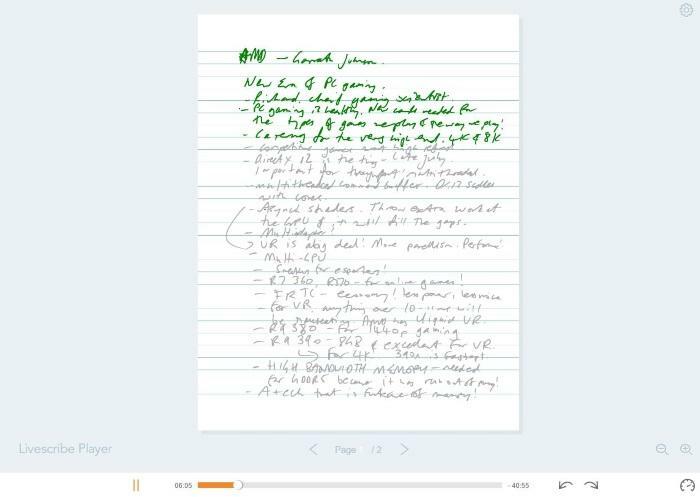 It's good for handwriting, sketching, doodling, and pretty much anything you fancy putting down onto paper and then digitising, but it also has one neat trick that makes it even more useful than that: you can record audio while taking notes, and then look at a live feed of your writing in action when you playback the recording. 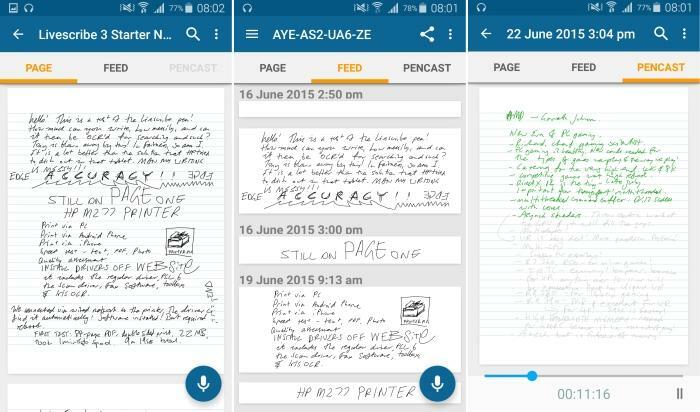 The ability to record audio that is automatically synchronised to your handwritten notes (called a Pencast in the app) means you can optimise your note-taking. For example, you can jot down important points during a presentation while the app is simultaneously recording audio, and when you play it back, you can tap on each point to listen to what was being said at the time that point was being written. It can make transcribing a simpler task as you don't have to listen to an entire recording. If you've taken copious notes during a recording, then the writing will light up line by line as the recording is played back, letting you know where you are up to in your notes. Playing a Pencast through the Livescribe Player on Livescribe's Web site. In addition to Pencasts, the Livescribe+ app allows you to simply view all of the pages that have been digitised, and you can also see a feed of your digitised pages according to the date they were made. Furthermore, you can send individual pages (as PDFs) to Cloud storage accounts such as Google Drive, or even email them to people. There is an option to 'share' an entire notepad when you hold your tap on it in the app, but this didn't bring up any avenues for us to actually share or save the notebook to the Cloud during our tests. The three different views: page, feed, and pencast. Pencasts can be sent to the Cloud and shared as well (again, as PDF files), then downloaded to a computer, and played via the Livescribe player on Livescribe's Web site -- you just drag and drop the downloaded file onto your Web browser. Handwritten notes are digitised automatically by the app, and this means that you can search for words in your documents as if they were proper, typed documents. However, if your writing is very messy, it might not find all instances (if any) of the word that you're after. It worked well enough for us -- considering that the mess we call handwriting these days more closely resemble a scribble. The main screen on the left shows the pages within the notepad. The screen on the right shows the results of a search for the word 'page'. 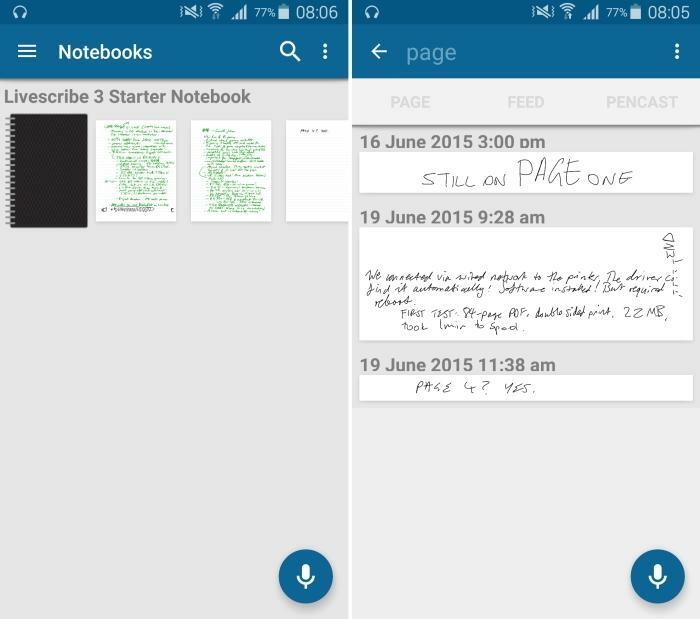 In order to convert handwriting to text, you must be in 'Feed' mode within the app, which will show you notes according to date and time. To convert them to editable text, you can simply swipe right on each individual note. The text can then be sent to your Cloud or emailed for proper editing. Again, how well this works will depend on how neat your handwriting is. We've seen natural handwriting capture for Android via devices such as HP's Pro Slate 8 tablet with Duet Pen, which allows you to write on a regular writing pad with HP's special pen, but only in a strict position in relation to the tablet. We were less than impressed with the results and overall comfort level of that type of implementation. We're much more impressed with the Livescribe 3 smartpen: it's portable, efficient, and offers a more natural way of taking notes. 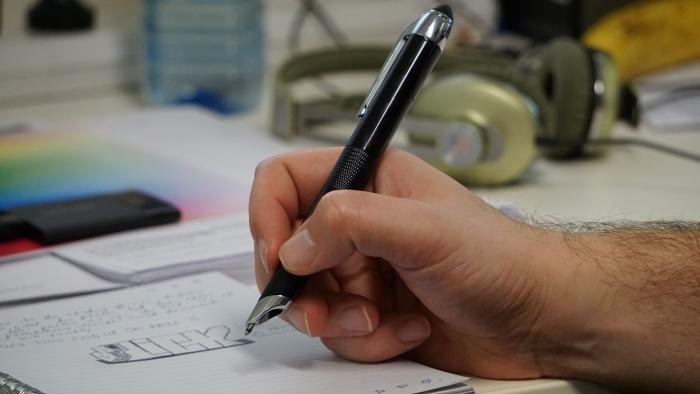 We think it's a highly useful tool for journalists, as well as anyone in the corporate world who has a need to take handwritten notes in meetings. Students should also find it to be invaluable in a lecture hall, though the price might be a barrier for most. The pen on it's own costs $199 (about $280 in New Zealand). Be aware that notepads and ballpoint refills will be ongoing costs. However, if you have a laser printer, you can print your own dot paper and make your own books. 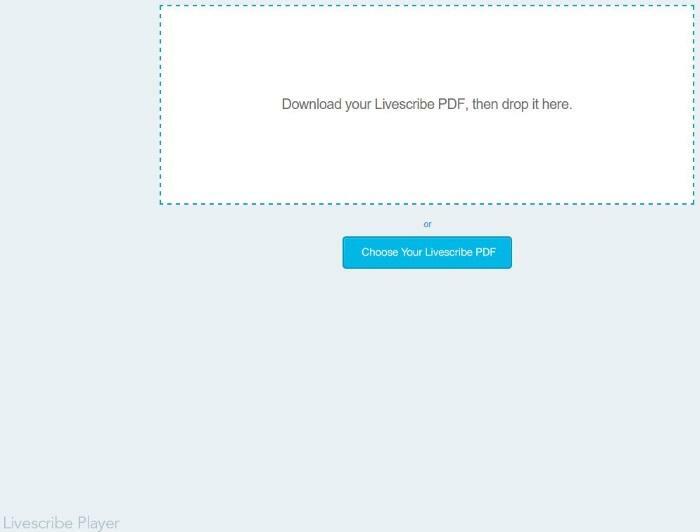 Livescribe's Web site has the details for printing your own dot paper.